Repair Mpeg 4 and AVI videos in just a few clicks! Digital Video Repair will fix broken MP4, MOV & AVI files encoded with Xvid, DivX, MPEG4, 3ivx and Angel Potion codecs, helping achieve a perfectly smooth viewing experience. Playing corrupted AVI files can result in blotchy or jerky playback, lockups, visual artefacts and audio-video desync. DVR will carefully repair the AVI file structures, re-encoding bad segments if required to ensure smooth, uninterrupted playback and full conformance to the original MOV, MP4 & AVI specifications. 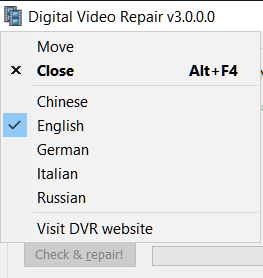 With Digital Video Repair (DVR), you can easily fix unfinished AVI files, MOV and MP4 videos that were only partially downloaded from the Internet (eDonkey, BitTorrent, etc) or a local network (DC++). Digital Video Repair can process a video, detect missing segments and reconstruct a partial or incomplete video file into a playable video stream. Problems with fast navigation through videos have become a thing of the past. DVR will analyze your recorded or downloaded video and create a new index for quick positioning if DVR determined that the original index was damaged or has corrupt data. Your video will no longer freeze after playing for just a few seconds. DVR will find broken pieces of video or audio and carefully delete them while maintaining sync with the sound and the video for smooth playback. You don't need to worry about losing some valuable fragments when the repairing video files anymore. The program doesn't makes changes to the original file, it always creates a new copy, and if the final result is not favorable you can always revert to the original version of the file. LICENSE: This program is distributed in the hope that it will be useful, but WITHOUT ANY WARRANTY; without even the implied warranty of MERCHANTABILITY or FITNESS FOR A PARTICULAR PURPOSE. A NECESSARY NOTE: Digital Video Repair come bundled with RelevantKnowledge research tool to help us keep this software free. RelevantKnowledge can be uninstalled independently from our software, using the Control Panel.